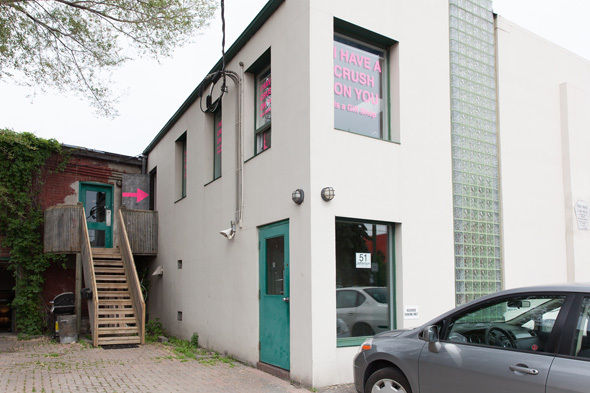 I Have A Crush On You is a gift shop meets gallery meets workshop that found its first home in Liberty Village at the end of May. 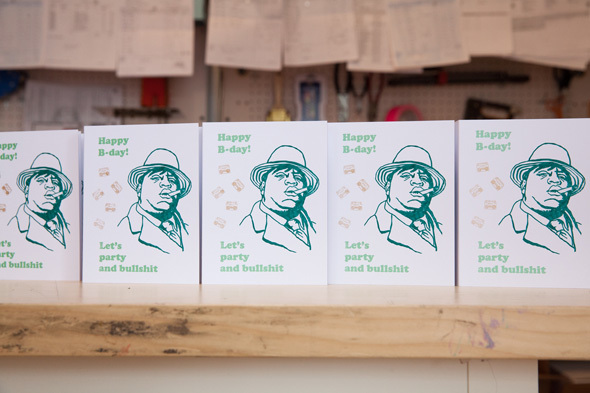 If you need a sassy greeting card for your friend with an offbeat sense of humour, or a piece of antique china with Rob Ford's confused face printed on it, you've found your haven. 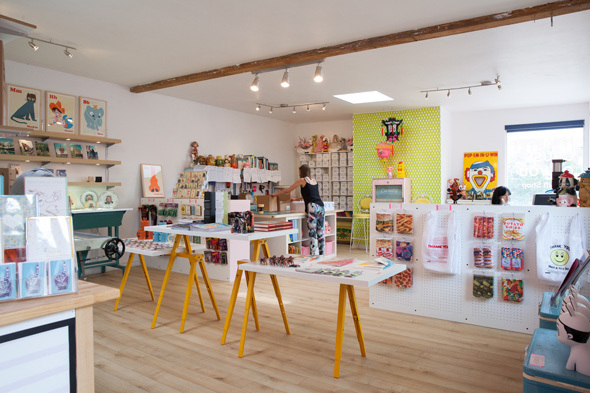 Amy Kwong opened the space in Unit 201 at 51 Jefferson Avenue at the end of last month, and she chose the name to match her already well-established paper goods and gift company, Smitten Kitten. "Smitten kitten means a girl that's in love," explains Kwong, who was spending her birthday on duty at the store. "After racking my brain forever, I'm like well obviously, Smitten Kitten, I Have a Crush on You - it just goes hand-in-hand." It's pretty clear that the space is a labour of love. 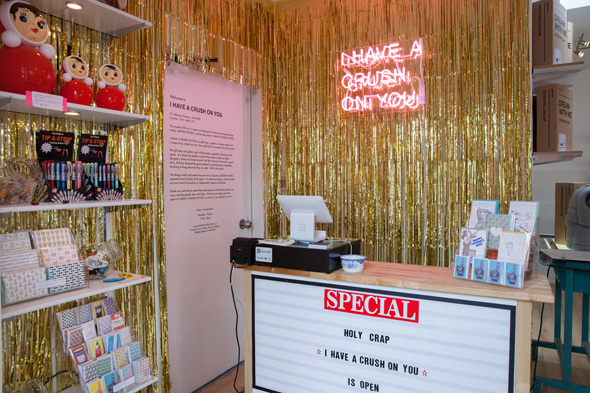 From the gold tinsel-covered wall to the little typewriter cards that explain why I Have A Crush On You carries each product, Kwong's personality and taste are front and centre. 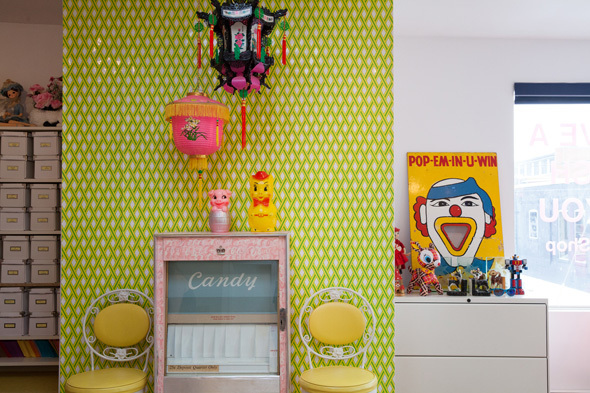 "Everything I bring in, I bring in because I love it," she says. Up until May of last year, when Kwong took over the 700 square feet at the top of a flight of wooden stairs, the unit had navy blue and beige walls, and heavy blue carpeting. It took five coats of paint to get it to what it is today - bright, inviting, and worthy of the natural features, like an exposed beam that divides the space right down the middle. After designing and printing stationery for almost 10 years, Kwong liked the idea of finally combining her workspace with a retail location in her favourite neighbourhood. "I've always loved Liberty Village," says Kwong, who was born in Hong Kong, went to school in England, and has lived in handful of other cities around the world. "There are no stores down here that sell gifts. And this building has a lot of artists, musicians, and clothing designers, so it's very creative. There's really good energy in this space." 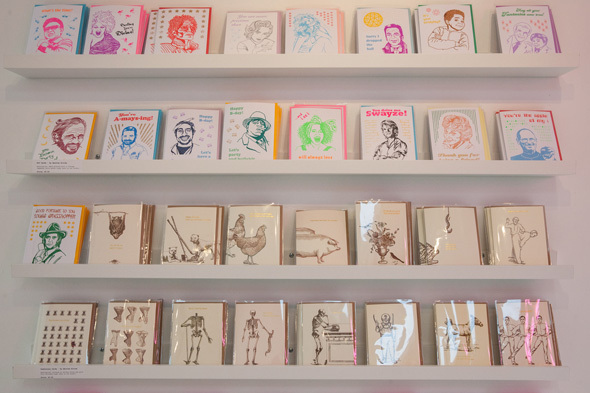 "Crush-worthy" Smitten Kitten products line the right-hand wall - two have won LOUIE Awards (which recognize outstanding greeting cards). 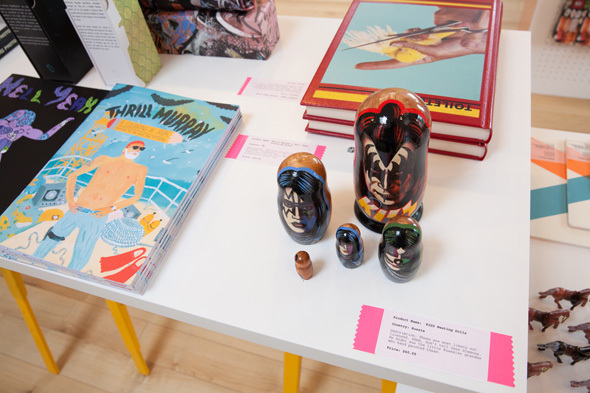 In addition, Kwong has carefully curated gifts, knick knacks, books, accessories and dĂŠcor items from all over the world. 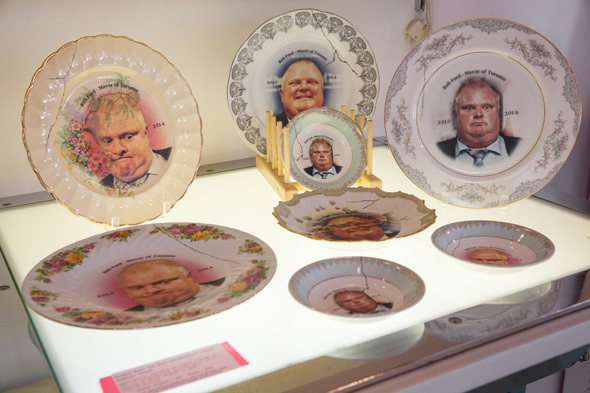 She visits trade shows in New York, Chicago and Toronto, and makes a few items in-house that are sold exclusively at I Have A Crush On You, like the aforementioned decorative Rob Ford china ($60 for a plate, $45 for a bowl, with a portion of the proceeds donated to CAMH). Another of Kwong's outstanding products: the ID Coasters ($18 for 12), which are wine glass coasters that stick to your glass and do double duty as wine markers. She is also excited about the Phonekerchief ($28), which blocks your cell phone's signal and lets your date know they have your full attention. 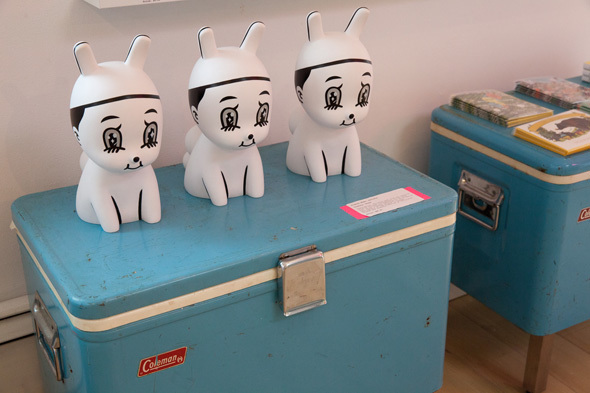 Kwong packed a lot of what she calls "thoughtful products" into her little retail and work space. She loves simple items with special packaging and a special purpose. "I would love for people to come spend some time and go through it all," says Kwong. "And then if they want to come and hang out in the back while I'm working, they're more than welcome to do that too." I Have A Crush On You is open Monday to Friday, 11 a.m. to 6 p.m., and Saturdays, 12 p.m. to 6 p.m. Photos by James C Lee.